Music festivals continue to be on the rise in the United States and all around the world. Statistics show attendance at these events is soaring, with over 32 million people in the U.S. alone going to at least one festival per year (that’s more than the entire population of Texas). Meanwhile, in Milwaukee, home to the largest music festival held in America, at Summerfest nearly a million fans enjoyed eleven days filled with 800 acts and over 1,000 performances. Which begs the question, how will music festival vendors cash in on all these music lovers attending these shows in 2019? First of all, let’s embrace the huge reach of today’s technology when it comes to marketing on social media. Research has revealed almost half (46%) of attendees learned about a particular event on these platforms. On the other hand, 30% of people watching these performances on a live stream will later purchase tickets to a similar event in the future. Food is always a popular menu item being successfully sold at local carnivals and state fairs. Pizza landed in the number one slot at music festivals according to numbers from Ticketmaster. Vendors often overlook “services provided” as a possible option. 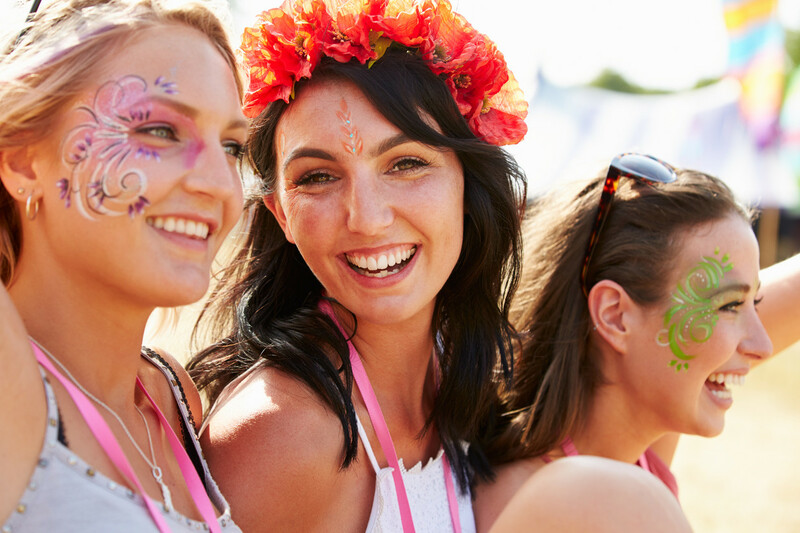 Whether you’re the provider or hire a professional masseuse team to offer relaxing rubdowns for festival goers, this is a great way to make a comforting killing at a concert. These attendees are already accustomed to standing in line waiting to gain entrance to the venue, so they won’t mind hanging out for a seat on a massage chair or waiting for a table. Massage stations practically sell themselves as those passing by are bearing witness to these soothing services being rendered. Customers will be more than happy to pay for (and receive) a pleasant massage before, during, and after performances. As younger generations continue to come of age, so does the popularity of tattoos, body art, and piercings. Significant tat stats reveal almost half of today’s rapidly growing Millennial population have at least one tattoo compared to 36% of the younger Generation X crowd sporting these spectacular ink renditions. As this trend continues to explode, similar to flower children at Woodstock from the sixties, face and body painting is another service to be rendered that’s taking the crowd by storm. Considering the small upfront investment of some paints and brushes, again whether you’re the artist or you hire some budding Picassos to perform this service, festival attendees witnessing the artwork in the crowd will want their own temporary masterpieces. Even if you aren’t artistically inclined, you can always take some classes, utilize simple design concepts, use stencils, and create artwork that ties directly into the venue, artist, or musical genre in some way. Even though these fan-favorite “finger foods” are always a smashing success, vendors think outside the box when contemplating these offerings. Speaking of boxes, other potential possibilities include carry-along creations, pre-packaged items like cookies, candy, chips, snacks, etc. Consider the demographics of your audience. For example, attendees at certain events like a Folk festival may be primarily vegans, so meat-on-a-stick might not fly with these festival folks. If you’re considering peddling food at these venues, be sure to check out the competition beforehand to ensure you’re not offering a duplicate delectable treat that might ultimately crush the bottom line and cripple sales. When offering food for sale, there are certain regulations that must be met as enforced by State and local officials from the food, health, and safety departments – don’t get busted for breaking the rules! In any event, successful vendors will shine brighter than the stars and those celebrities performing on stage at music festivals with unique presentations of a rocking product or service. Keep these music festival vendor ideas in mind as you look forward to 2019. And as we all ring in the New Year, here’s wishing you and yours a prosperous, music-filled, money-making event with memories to last a lifetime. CHEERS!